Hibernation is one of the more effective strategies temperate animals have developed to survive winter's cold temperatures and lack of food resources. Many birds, bats and even insects opt instead for seasonal migration, exploiting distant habitats during different seasons. A few, like the Monarch Butterfly (Danaus plexippus) and the Poorwill (Phalaenoptilus nuttallii) use a combination of the two. Poorwills, relatives of Nightjars, breed in arid parts of western North America from southern Canada into northern Mexico; northern individuals seem to winter in the desert southwest. A number of bird species use daily torpor to minimize energy loss during cool nights or brief bad weather. 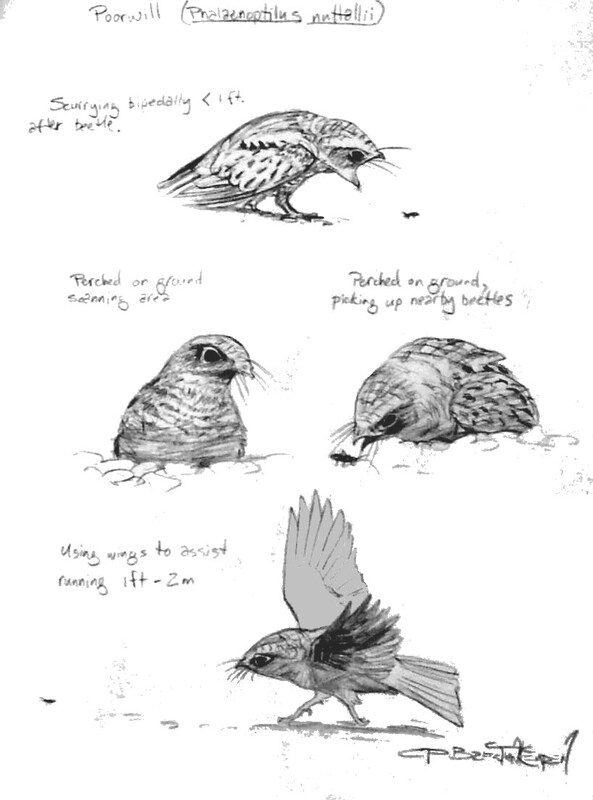 Members of three related orders, the goatsuckers, hummingbirds and possibly the swifts, all show some abilities at metabolic adjustment, but none to the degree of the little Poorwill, which, in addition to its natural tendencies toward torpor, feeds heavily on beetles, rich in polyunsaturated fats, which remain liquid and metabolically available at low temperatures. In the laboratory, Poorwills have been observed sustaining periods of torpor for over 80 days, and in the wild as long as 25 days. A shallow shelter, open to the southern sun is selected: a patch of cactus or rock niche to which the bird develops substantial fidelity. 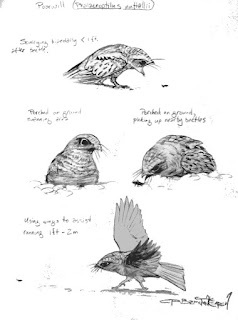 After sundown, the torpid Poorwill's body temperature begins to fall, until the ambient temperature reaches 5.5°C, an apparent optimum hibernating level which the bird tries to maintain. Solar radiation raises the body temperature daily, presumably allowing the option to forage during warm nights. I know of no human witnesses to a Poorwill rousing from torpor in the wild, but I imagine the bird backing out of his shelter to fully bask in the final evening rays, periodically flapping his wings to elevate his body temperature. It's not known how severe a winter these birds can survive, but a sufficient winter insect population, rather than temperature, is probably the limiting factor. upper: REANIMATION: COMMON POORWILL (2012) acrylic on illustration board 30" x 20"